Travelling Emirates Business Class with a Toddler – Doha to Mauritius via Dubai. It was my first times. First time travelling to Mauritius with my toddler but without my husband. First time leaving Doha. First time on Emirates airline. First time in Dubai. What a journey! In 1985, Emirates started its travels out of Dubai with only 2 planes: a leased Boeing 737 and an Airbus 300 B4. Now, it has a fleet of more than 230 planes, and flies to more than 140 destinations in more than 80 countries around the world. 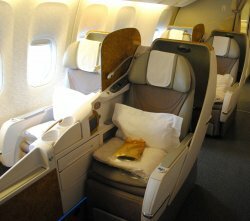 The website (www.emirates.com) is very user friendly and it’s actually quite easy to plan and book a trip. Paradoxically, we managed to make a mistake while filling in the name of our daughter (!!!) but thanks to the phone assistance, it all got sorted straightaway (a big PLUS for Emirates airline). However because we had to make a separate ticket for my daughter, my name wasn’t linked to hers and unfortunately we could not check in nor choose our seats online. 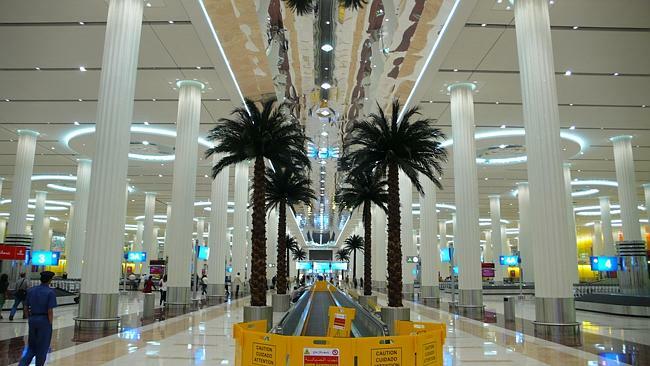 Clearing customs at Hamad International Airport (HIA) was like a breeze. I was asked for my passport, boarding pass and my Qatari ID and those of my daughter. Being on my husband’s sponsorship, I wasn’t required to provide any other documents, which was a relief. Check-in was quite quick and efficient with helpful staff. Having 137 extra-wide check-in aisles surely makes a difference in terms of rapidity. As soon as I went through the security checks (this went really fast too), I was stunned by the size of the terminal and the incessant movements. It was much busier than I had imagined; there were people and shops everywhere! 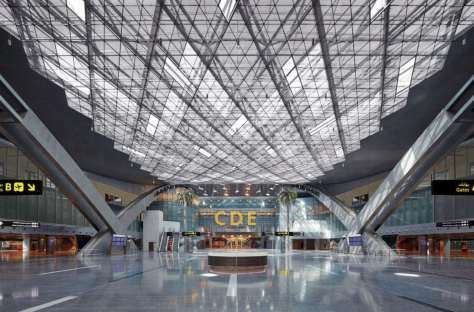 The airport has an initial annual capacity of 30 million passengers and believed to be able to handle 50 million passengers per year upon completion. HIA has 8 lounges and 1 more opening soon. It also has a fitness centre, a 200-room hotel and quiet rooms. The airport works closely with Qatar Museums Authority and showcases many art works by local and international artists. HIA also has facilities like prayer rooms, parents’ rooms, family toilets and 5 activity nodes for children. Each activity node offers televisions, Internet browsing, toys, mini-rides and climbing frames. Unfortunately I couldn’t try the Oryx lounge; I was informed it was on a different level and it was already 10.30 p.m., my daughter was on the ‘sleep mode’ and I was required to board at 11.00 for the 11.45 p.m. departure to Dubai. That would be for next time. The plane left for Dubai around 11.45 p.m. and given the late hour, I didn’t have the opportunity to use any of the ‘entertainment services’ provided on board. Cold dinner was served; we were both hungry so it was convenient. I was informed that my 2 year old has to sit by herself on a separate seat and not in my lap as she looked ‘old enough’ to be able to do that. Fortunately she was fine with that and both the take off and landing went well. Because of the design of the seats, eventhough I was sitting next to my toddler, I couldn’t see much of her. Luckily for us the flight was very short. I requested for my luggage to go directly to Mauritius which was a good decision as being on my own, with my two year old, I wouldn’t have had enough time to go through the whole immigration/check-in process again for my next flight. 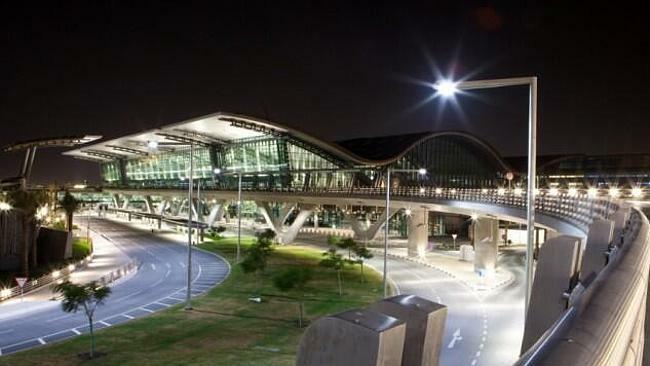 We landed in Dubai around 1.35 a.m. and my next flight was at 2.45 a.m. Dubai time. No time to check out the lounge here either. I was already quite impressed with HIA being so big and busy but when I saw Dubai International Airport (DXB) then I realised how huge the latter really is as compared to the former. This time I was really really stunned! When I got out of the plane I thought I was going to get lost among so many people and signs and lights and cafes and shops…Luckily for me, the signs were very clear! I was amazed by how easy it was to get to the gate for the next flight to Mauritius. After walking with my half-slept toddler in my arms for about 20 minutes including catching a light train to get to Gate A, I started to wonder why I declined the offer to book a stroller at the check-in counter! The airport has the capacity of handling 75 million passengers per year, with Terminal 3 having the capacity of handling 47 million passengers. DXB has exclusive lounges for its Emirates first class and Business Class passengers and a specific lounge for all Emirates passengers. It also has a luxurious 88 rooms and suites hotel, a Business Centre, a health club, a variety of world cuisines, an airport medical centre, quiet rooms, prayer rooms, a post office among many other facilities. WOW! I cannot find suitable adjectives to describe the plane. It was beautiful. 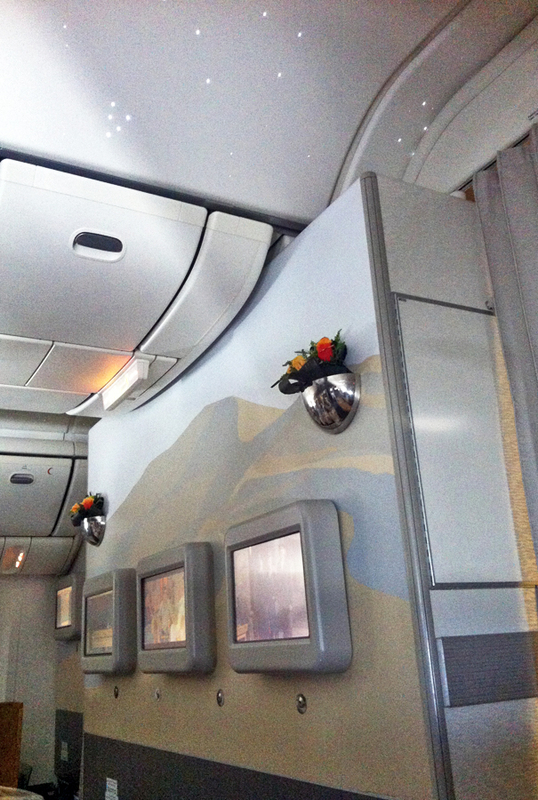 I noticed some exotic fresh flowers to decorate the plane as well as some natural orchids. The seats were very comfortable and turned into a really flat bed. I was even offered a ‘mattress’ to put on my flat bed! That was awesome! It felt really nice to lie down and rest and I quickly fell asleep. Meal time is like fine dining: foods by award winning chefs served in china tableware on tables laid with fine linen. ‘Light bites’ served, a few hours into the flight. Over 2000 channels of movies, TV shows, music and games to choose from. Also available: movies with Audio Description and Closed Captions for those who are visually or hearing impaired. You can create your personal playlist. There is an Onboard Lounge where you can meet people while choosing to eat from a selection of canapés and cocktails or hot and cold beverages, served by a bartender. Different kit bags for men and women, both signed Bvlgari. 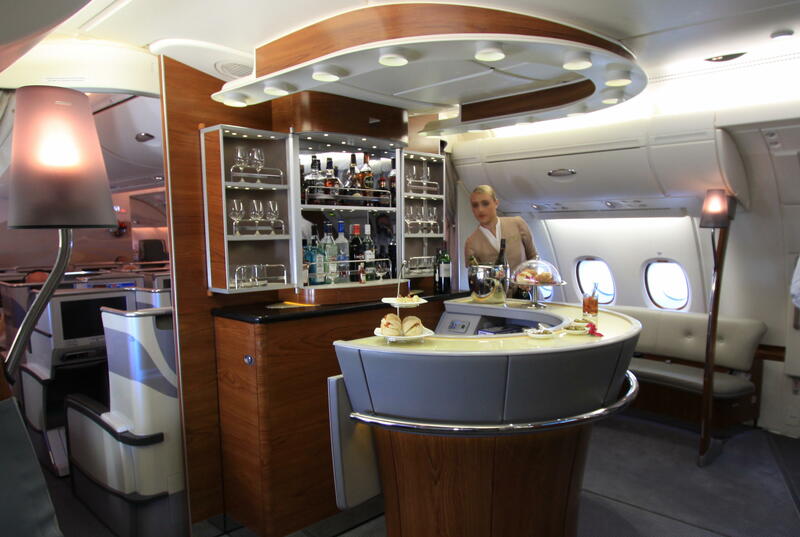 Personal minibar next to your seat. Consistency Issue. This time I was told I had to hold my toddler in my lap for take off, as she looked too small to sit by herself! The food selection was great but at 2.45 a.m. I did not see many passengers interested in eating. Many even skipped breakfast preferring to sleep. Service Issue: although I told an air hostess not to wake me up for breakfast and I filled in a form (which was never collected), I was still asked if I wanted breakfast by another flight attendant. Lucky I wasn’t sleeping then. When my daughter was sleeping I suddenly saw an air-hostess by her side, lifting her head up to put a pillow. I was both surprised and upset. Surprised as I had never asked for one and upset as she didn’t ask me first. My daughter doesn’t use a pillow and she could have woken her up by lifting her head etc. Resettling a baby/toddler on a plane in the middle of the night can be a real challenge (trust me). I ordered some oats for my daughter and the attendant who went to get it never came back with it. When I asked another one, she informed me they only has Muesli and oats was not available. 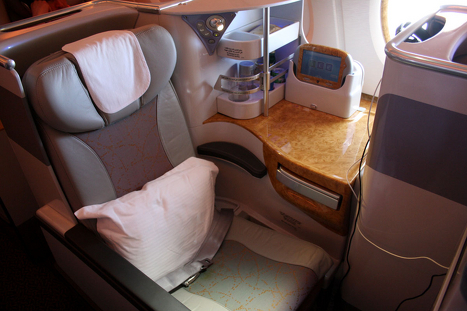 My first time on Emirates and in Dubai was more or less a positive experience. The technology was a bit over the top for me, particularly at that time of the night; the flashy gadgets, not really for me. Some flight attendants can be over-enthusiastic and you’d be amazed at how some manage to keep a permanent smile on their face… Let’s hope this experience is going to be much more worth it when going back to Doha. According to the 2010 estimate cited in the Economy Watch, the total value of imports for Qatar is US$23.38 billion, the main imports being: machinery and transport equipment, food and chemicals. The primary import partners are: the US (13.43 % of total imports), Italy (8.34 %), South Korea (8.33 %), Japan (8.04 %), Germany (7.31 %), France (6.26 %), UK (5.59 %), China (5 %), UAE (4.67 %), Saudi Arabia (3.96 %). With such figures, it is of no wonder when doing your grocery shopping you will see more imported food than local produce. And of course, their prices are much dearer than local ones. At times you don’t have a choice either; it is imported or simply not available. It is estimated that Qatar imports almost 90% of its food items. 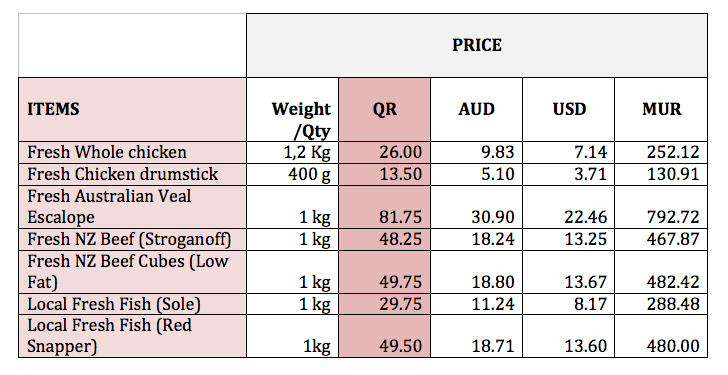 Moreover prices are also dependent on the fluctuation of the international food prices. 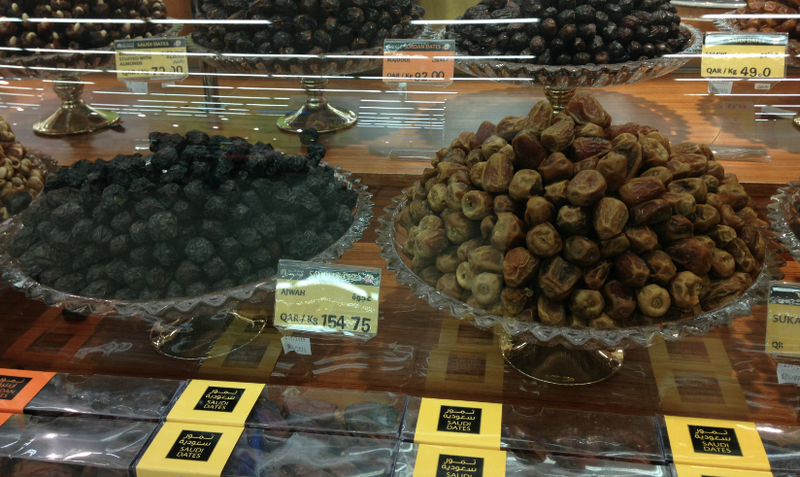 There are many shops, markets, supermarkets and hypermarkets where grocery shopping can be done in Doha. Common names are Lulu Hypermarket, Almeera, Carrefour, Megamart, Family Food Centre, Spinney’s, Geant. 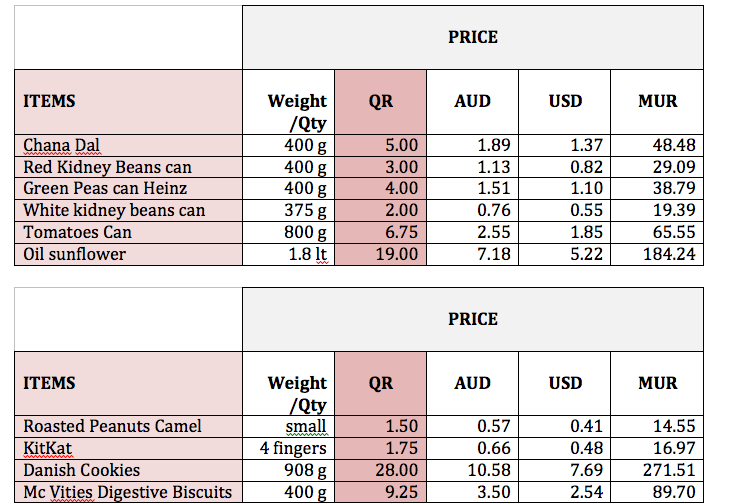 Prices vary depending on whether you are buying imported or local and also which shop you are buying from. For example Lulu Hypermarket is believed to offer the lowest prices as compared to Carrefour and Almeera. 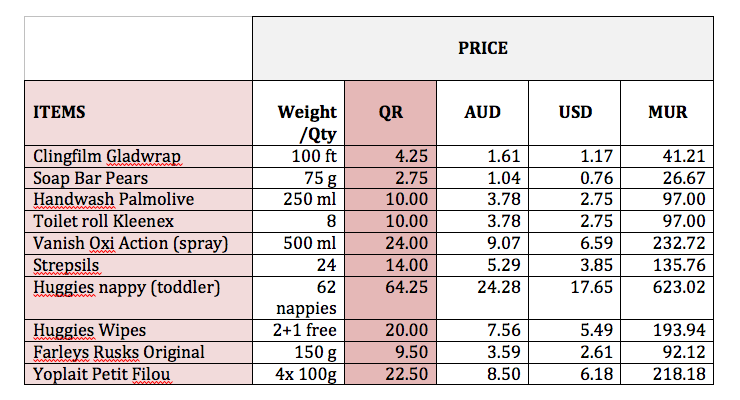 An Approximate Price List of Some Everyday Items at Carrefour (City Centre). 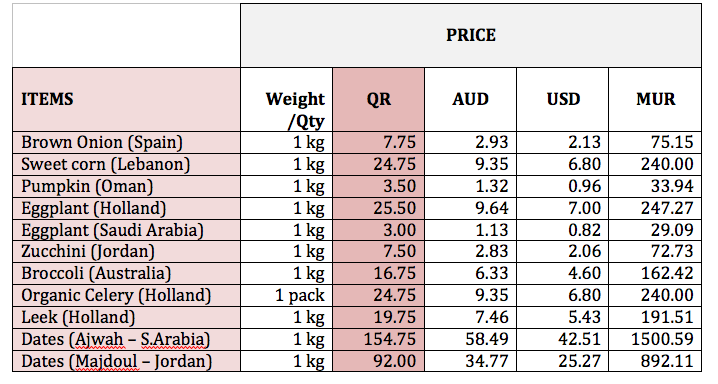 The following list is based on prices of articles during August, September and mid October 2015. 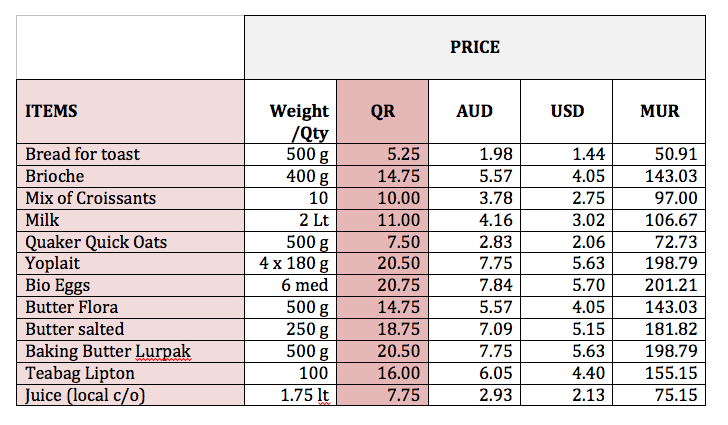 Although I could unfortunately not include as many products as I wanted, I hope people moving over to Doha can get a rough idea of the price range they can expect for grocery shopping and have an idea of how the prices compare to their own country. I also hope I can add to this list as soon as I have the opportunity to do so. How do these prices compare to those in your country? Fancy an Immersion into Art and Culture? 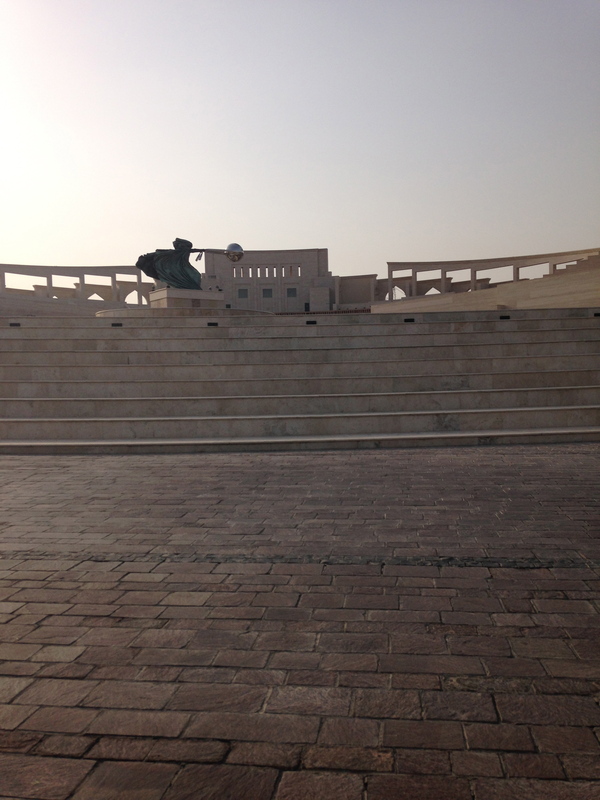 Head to Katara Cultural Village. One word to describe Katara Cultural Village: charming! What’s striking when you first lay eyes on the village is the architecture. It’s very different from Doha’s city centre which has so many modern skyscrapers with all different shapes. Katara is … charming! In around 150 A.D. Qatar was known as ‘Catara’ and then later ‘Katara’, hence the name of the cultural village. The buildings and facilities have been built in a way to remind of the Qatari cultural heritage and traditional architecture; when you are there you feel you are walking in alleyways of the olden days. No skyscrapers, no modern buildings with glass exteriors. Some of the buildings have a shallow water canal flowing around them, just like it used to be long ago, when this system was used to keep the surroundings cool in warm weather. Very calm and relaxing. The village houses heritage centres, libraries, art galleries, an opera house, cafes, restaurants, an amphitheatre, a drama theatre, a beach and several other facilities. 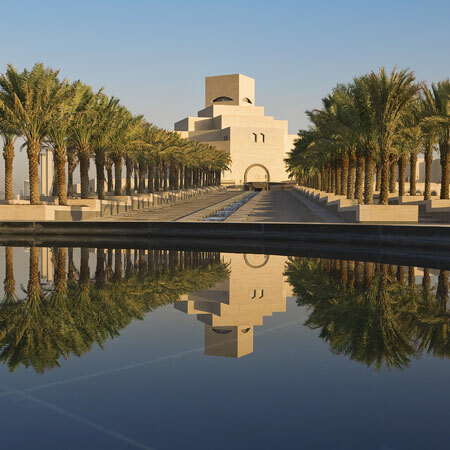 You will also find many organisations and societies in Katara, such as: Qatari Society for Engineers, Qatar Fine Arts Society, Qatar Photographic Society, Qatar Music Academy and Theatre Society, Visual Art Centre, Childhood Cultural Centre. 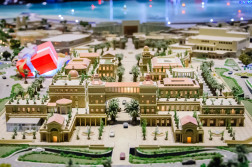 Katara Cultural Village prides itself to become “the largest and the most multidimensional cultural project of Qatar”. It all sounds a bit hyperbolic but a few snaps of the master plan proves that this vision is well set on its path to become reality. Accordingly to Katara’s masterplan, only phase I has been completed; phase II is under way; Phases III and IV are yet to be executed. A mosque covered with beautiful gold coloured mosaic tiles. You can enjoy some nice food in the café after choosing on the menu app from its tablets! You can also read the news from a teleprompter, edit your final recording and bring it home! I love the amphitheatre. It is pure beauty. It looks like it comes straight from Greece! With the seating capacity of 5000 people, events held there will be surely grand. You have to pay to get access to the beautiful beach where you can enjoy various water sports. You could go for a Gondola ride or if you fancy a whole day at the beach, you could rent an air-conditioned tent for the day. All quite pricey. Parisian, Italian, Egyptian, Indian, Turkish and Armenian cuisines plus a specialised seafood restaurant. Karak comes from the Indian language meaning strong and refers to the strong tea, truck drivers used to have when they stopped on the side of the road in between their long distance drives. Karak is a spicy sweet tea and is a must have just like the sweet or plain chapati (bread) made with whole-wheat flour. Karaks and chapatis are well known in Doha and are a ‘must-try’. 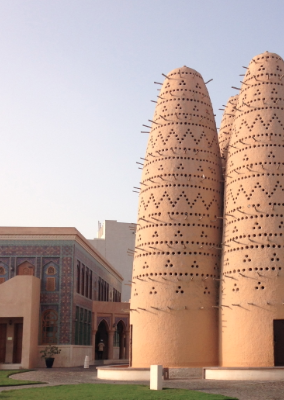 One or a couple of visits to Katara is not enough to see everything the village has to offer. I will have to go back; hopefully to attend an event or just for some more karak and more snaps. 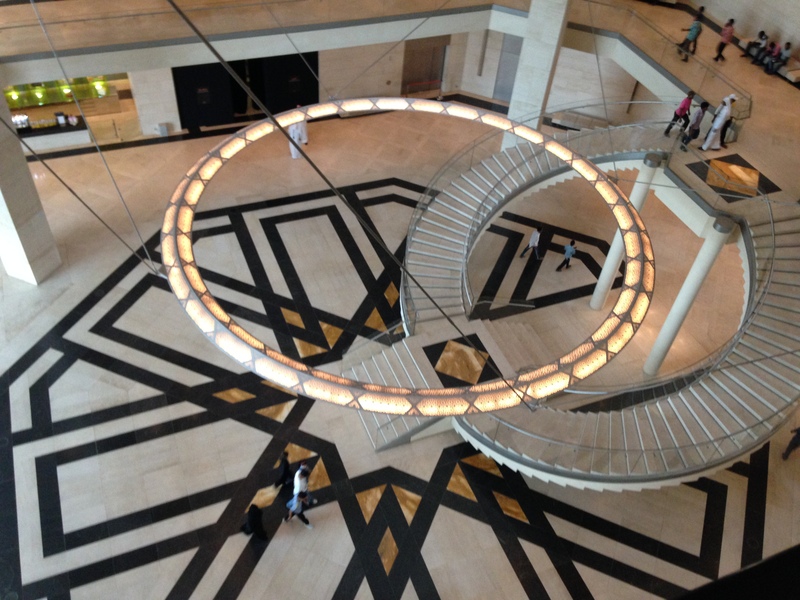 The Museum of Islamic Art, Doha: a Piece of Sculpture. I wondered what this building could be: an old fort? A palace? A government building? It is sand coloured and looked more like a one big block formed by many smaller superimposed blocks to me. What could it be? I only understood its beauty when I visited the Museum of Islamic Art (M.I.A), designed by I.M.Pei, the same architect who designed well known structures like L’Enfant Plaza Hotel, Washington DC, Miho Museum, Japan, the Pyramid at the Louvre Museum, France. From far, it looks like a few blocks but on approaching the building, you will see more specific forms: the shape of the bridge, the arched windows, and the dome itself. 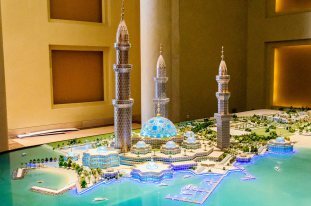 The sand coloured M.I.A is built of limestone from France, granite from the United States, stainless steel from Germany and architectural concrete from Qatar. The structure is a powerful Cubist composition of square and octagonal blocks stacked atop one another and culminating in a central tower. An esplanade of giant palm trees leads to the island. Inside the museum, 41,000 square feet of galleries are organised around a towering atrium capped by a dome, with a narrow beam of light descending from its central oculus. – The New York Times. According to The New York Times, I.M.Pei wanted to create a ‘building’, which would reflect the “essence of Islamic architecture”. He travelled a lot and did much research to finally come up with the structure of the MIA. What I.M.Pei says reflects exactly what I thought when I first laid eyes on the museum; when you look at the building you see something very simple but it is much more than that. Moreover, the musueum has been built on a stand-alone island on The Corniche, created only for it as per I.M.Pei’s request; he didn’t want any future construction to stand in the view of his unique creation. From outside, one cannot imagine the beauty and immense treasures the museum hides inside. When you walk in, you are immediately struck by the huge size of the atrium, the endless marble spiral staircase and of course the unique circular ceiling light. (Wouldn’t that be a piece of art too?). There is a vast collection of objects on display, some dating from the 7th century. It was interesting to learn that Qatar has deep links to the Persian Culture, to the Safavid and Mughal empires among others. 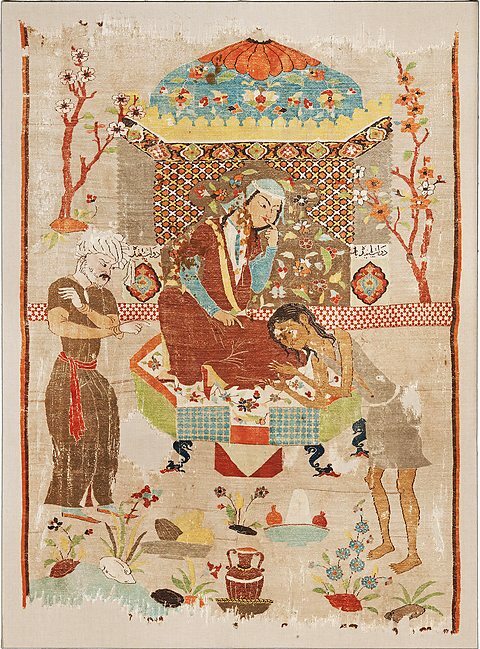 There are also unique pieces from India, China, Egypt, Syria and other countries. I saw some antique pieces which I couldn’t have guessed existed: an old key of the door of the ‘Kaabah’, ancient scriptures of the Quran (written around 7th/early 8th century), ancient tapestry, some pieces of clothes used in ancient times, an Indian jade pendant which belonged to Shah Jahan (the one who built the Taj Mahal for his wife), gold coins and royal seals. An ‘object’ which really impressed me was a copy of the ‘Shahnameh’, also known as ‘The Book of Kings’. It was written more than one thousand years ago by the Iranian poet, Ferdowsi. It is a long epic poem and considered as the world’s longest epic poetry written by one single poet and also considered as a masterpiece due to its influence on both the Persian language and the Persian culture. Now, to the teacher and poetry lover like myself, this was quite significant! The colours and pictures on display are really amazing and worth seeing. 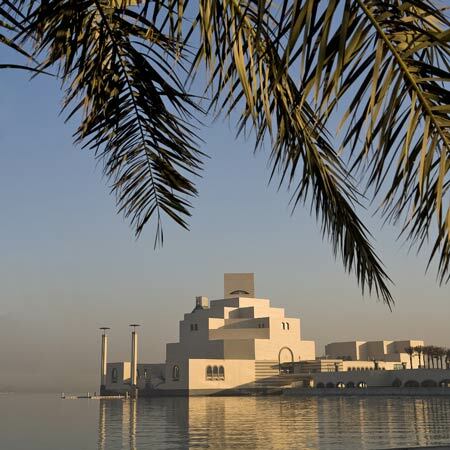 After a full immersion in Islamic art, you can relax at the M.I.A café which offers a stunning view on the Gulf Sea. The café was designed by the French Phillipe Starck (known for designing Steve Jobs’ yacht and hotels all over the world) and is simple elegance. The staff is professional and the food is exquisite. Children are also well looked after. Finally, you can browse all the items and books for sale in the gift shop. You may find something to your taste. Well … I did. The entry to the museum is free; there are many parking spaces, free WiFi and free guided tours every Wednesday and Thursday at 2 p.m. and every Saturday at 4 p.m. The museum also organises activities for families which you can find on its website. 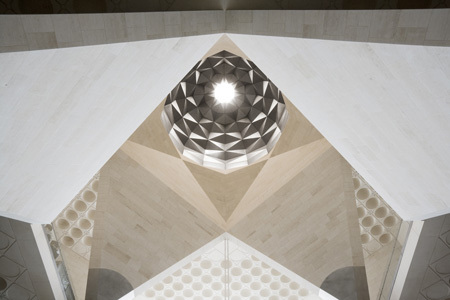 Once you visit it, may be you too will think like I.M.Pei: the Musueum of Islamic Art itself is “a piece of sculpture”. This week my husband had one week off work for the Eid festival. We were thrilled as it meant we could have some family time out! We thought why not enjoy Doha? After having heard lots of positive reviews about Marsa Malaz Kempinski, a 5 star hotel in The Pearl, we decided to try it out with our two-year old. Marsa Malaz Kempinski is located on its own private island in The Pearl, with 150 metres of private beach. Amongst many other facilties, the hotel has several outdoor swimming pools, water sports facilities, tennis courts, a kid’s club, 11 food and beverage outlets, a spa with an indoor pool and 281 spacious rooms, among which some luxurious suites. On arriving at the hotel, I was quite impressed with the décor; everything smelled of luxury: the extraordinary chandeliers, the unique furniture, the endless marble floors, the high ceilings with unique-designed cornices, the unique coloured roses and orchids. We were greeted by ever-smiling staff and everything was done to make sure we were at ease and enjoy our stay. When I looked at the pictures on the website, I had serious doubts about how the room we booked will look in reality. However I was agreeably surprised when I saw our room: it was way nicer than on the website! It was real luxury. Again, the cushiony carpet, the designer furniture, the unique chandeliers and lights, the Villeroy and Boch bathrooms, the paintings and the special attention (like the fruits and nuts, the flowers, the personalised welcome note). Everywhere I looked in the hotel, I had that impression of cleanliness, of luxury, of caring – or should I say opulence? An impressive blend of Arabian elegance and European grandeur […] The hotel hosts more than half a million pieces of mother of pearl: 330,000 decorating the walls and 280,000 hand carved into the furniture seen in most of the rooms. 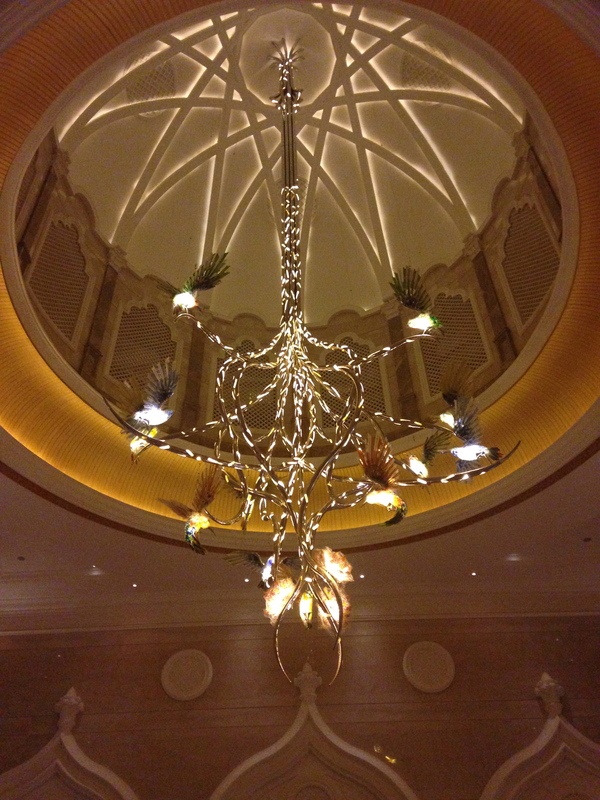 Another attraction includes the hand-made Murano glass oyster chandeliers from Italy, which took three weeks to assemble all the 44,000 pieces of oysters across four chandeliers exhibited within the hotel’s lobby. Spending 5 days in a hotel with a toddler can be challenging but here it seemed like 5 days stay is simply not enough. There are so many things I did with my daughter. We played a lot in the Kid’s Club; the two staff members are very caring and full of ideas to keep kids entertained. The first two Eid days had brunch for the kids with a wide selection of food and drinks. There are activities for all ages but also activities that the club plans as a group and which indeed keep the kids busy! Then, there are the different swimming pools which suit all ages. My two-year old had lots of fun in the very shallow one with other kids her age. We also spent some time at the beach where she made quite a few sand castles and destroyed all the ones my husband made; she enjoyed the warm Gulf Sea water, under the watchful eye of one of the many lifeguards (and mine too!). Although the Gulf Sea water is not the beautiful blue Mauritian sea water, it is still enjoyable. The breakfast, tea and dinner experience was also exquisite. Each of the hotel’s restaurants has its own speciality; we ate mainly at ‘Sawa’ which I highly recommend. The staff are very caring and the food is one of the best I have eaten in a five star hotel. The breakfast buffet had food for different tastes and the international dinner buffet was sublime: we tasted some exquisite Japanese, Spanish, Indian, Chinese, American, Arabic cuisine with delicious and unique deserts. I’m not much of a desert person but I must admit I had so much desert that Im almost certain of having already put on some weight (and Im not joking!) It was great that the restaurant also has a Kid’s Menu although my toddler enjoyed the selection of food already offered; we also ordered some chips ‘just in case…’. The high tea at Café Murano was another treat to the palate with the exotic sandwiches, cakes, and scones, all served in designer tea sets, with view over the sea. The weather was so beautiful in the afternoon that the view from the huge window panes looked like a painting. There was quite a few honking that could be heard at night, so it might be a good thing for the hotel to have some signs outside to discourage honking. It’s not very pleasant to hear these at night, particularly when you are already in bed! The Kid’s Club could provide more age-related books and games like for example, age-related wooden puzzles for under 3 years old, some playdough, etc. Maybe these little ones could have a dedicated area only for them, without the TV and the video games. Some of the staff members can be over zealous leading to some false assumptions on their part. They can surely remain professional without over-doing things. The hotel is 12.5 km from Hamad International Airport and while you are there if you have some spare time, you could visit Katara Heritage Village (3 km) and/or the Museum of Islamic Arts (9 kms). Five days are over but we are almost certain that we will go back, with our toddler! There were so many other activities which we couldn’t do (some of the timings clashed with my daughter’s nap time); but, as my husband put it so well, “if we want to do everything then we would have to stay for a month at least!” – although I think one month in a hotel might be a bit too much, don’t you? Before coming to Doha, I heard many stories about the ‘aggressive’ style of driving over here. I must admit that when I first arrived, I felt that way too. My heart missed a few beats each time we were on the road as it is ‘normal’ to witness near misses or even accidents (minor collisions) everyday. Paradoxically though, the more time we spent on the road, the more I got used to the driving style and it is only then that I realised that the driving cannot be compared to the erratic driving I saw in Bombay, some parts of Mauritius, and worst of all, Cairo! It isn’t that bad here after all. Doha, being the main city of Qatar, roads can indeed be very busy with all sorts of vehicles although the vehicle preference here is big SUVs. So when you are on the road, you feel you form part of a life-size video game where cars are ‘fighting’ to reach their destination (a bit like ‘Taxi’ or ‘Cars’ – you get the picture, right?). You can start to wonder whether it is against the law to indicate when you change lanes or to respect the speed limit! This style of driving is quite hard to understand given that penalty charges are quite high. If you jump a red light you could get a fine of 2000 QR and going over the speed limit has some high penalty charges as well. Doha drivers surely know where the speed cameras are! There is a ‘no phone’ policy but maybe it hasn’t been clearly explained to the drivers as I see many of them with a phone behind the wheels! Fortunately for drivers, the roads are in excellent conditions and having dual or three-lane carriageways make it easier to drive to your destination. Speed limits are well indicated by signs; within city areas they generally range from 60 Kph to 100 Kph, and on out-of-town roads the limit is 120 Kph. The only catch is that you have very limited route options to go where you want and if you choose the ‘wrong’ time you could get stuck in traffic for hours. Doha is notorious for its traffic jam! If you drive when schools and universities are in full swing, (like now) you will understand why. Do not be offended if drivers do not indicate when changing lanes; it is what most drivers do here. Keeping your lane when driving and at round-abouts is not normal for the majority of drivers. Honking is normal for many. Don’t be alarmed. Always keep calm and be patient. when driving on the other side of the road, stick to the line/lane marking closest to you, to avoid crossing to the other lane. avoid the fast lane (that’s the left lane, here); better to stay in the middle lane. plan your route before you leave for your destination. don’t worry about other drivers honking behind you specially at a round about; take your time and only drive when you feel it’s safe to do so. If possible, when you first start driving, avoid peak hours. It can take you a few trips to the Traffic Department if you do not have all your documents with you when you apply for your driving licence. I hope the following information will save you the hassle. Once your residence visa has been approved and you get your Qatari ID, you can apply for your licence. If you hold a licence from a Gulf country or from one of the following countries, you won’t need to take a driving test and can simply exchange your licence to a Qatari licence. 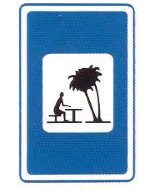 In this case, it is usually issued on the spot. The countries are: Andorra, Australia, Austria, Belgium, Brunei, Canada, Denmark, Finland, France, Germany, Greece, Hong Kong, Iceland, Ireland, Italy, Japan, Liechtenstein, Luxembourg, Malaysia, Monaco, Netherlands, New Zealand, Norway, Portugal, San Marino, Singapore, South Korea, Spain, Sweden, Switzerland, United Kingdom, and Vatican City. Completed Application Form, typed in Arabic and then signed by your sponsor. Have an eye test done and the relevant form filled. The department you should contact is: Madinat Khalifa Traffic Department, Khalifa Street; Contact number: +974 4489 0666; Opening Times: 7:00 to 11:00 a.m and 4:00 to 7:00 p.m. NOTE: If you don’t have a licence from one of the above listed countries, you will have to take a driving test. You can read here for more information about driving tests and driving schools. Although the traffic in Qatar seems very daunting at first, you will end up adapting to the style of driving. I haven’t started driving yet but after seeing my husband drive like a Formula-One driver on the other side of the road just after a few weeks, I know that I will be able to do it. Also, not having to sit through the driving test does take a big load off! 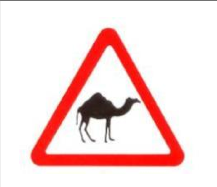 Till my next post on my next adventure, buckle up and … let’s get driving in the wild wild west…no sorry…on Doha roads! P.S I’ve finally got that driving licence!